The DiaGel Diarrhea Control For Medium Dogs 3.0ml Syringe Box of 6, model #570602, is an oral gel that supports digestion and bowel health in both cats and dogs. DiaGel is offered in numerous sizes to accurately dose the animal due to their weight. The DiaGel Diarrhea Control For Medium Dogs 3.0ml Oral Syringe Box of 6 is an orally given product which supports proper digestion and bowel health through the use of natural ingredients and essential oils. The formulation is microencapsulated to seal in the strong taste of essential oils, creating a palatable blend that dissolves after passing the dog's or cat's taste buds. Microencapsulation ensures DiaGel is palatable and easy to administer formula. DiaGel helps maintain a healthy intestinal tract. For use in Dogs. Helps maintain proper digestion and bowel health. May be given to dogs of all ages. May be used in conjunction with antibiotic treatments. May be used for pre-stress. 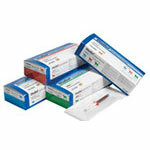 Oral syringes are individually packaged in sealed tyvek peel-and-pull pouches. Product is packaged as 6 oral syringes per box per dog size. Tyvek packages and shelf cartons are color coordinated. Outside box has a perforated tear-out end for easy dispensing. You get a total of 6. Indiscretions or Changes in Diet: Garbage gut and changes in diet and/or water may lead to diarrhea. Stress or Environment Changes: Activities such as boarding, breeding, traveling, showing, or any other activity that may lead to diarrhea. Directions For Use: Remove the oral syringe tip cap. Place the oral syringe between the side teeth of the animal, aiming as far down on the back of the tongue as possible. Gently push the plunder to release the gel. Discard any unused portion of the gel and oral syringe after use. Storage: Store in cool, dry place protected from light. *Note: For dogs exceeding 120 pounds, give an additional oral syringe(s) to equal the dog's weight.